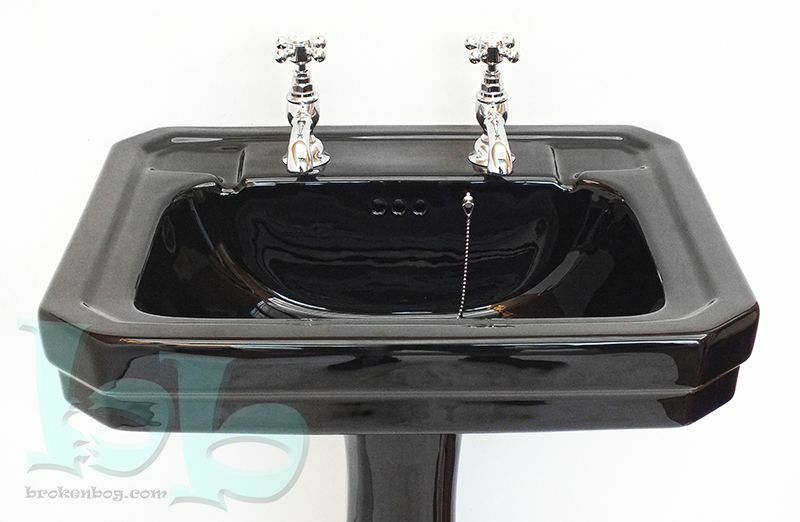 This elegant Art Deco style washbasin (sink) and pedestal in Black is based on the 'cut corner' design popular from the 1920s through to the 1950s and would look stunning as a focal point to a modern suite, or paired with the matching WC suite that is also available. This beautiful cut-corner range brings the style from the past, along with today's craftsmanship and 21st century technology. This range is exclusive to Brokenbog, and is also available in a range of over 50 other colours. Other sizes and tap hole configurations are also available along with traditional style taps to compliment the look perfectly. If Black is not what you're looking for, then please give us a call on 01428 608164 and we can discuss availability of other classical colours. These items are made to order, and can take 4-6 weeks for the manufacturing and glazing process. Please bear this in mind when placing an order, and we will advise of any delays at the point of order. 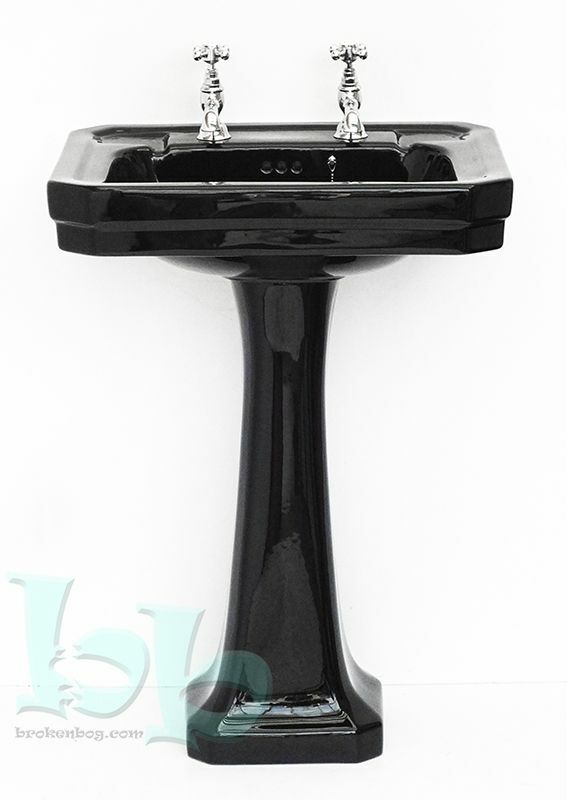 The price includes washbasin and pedestal only, taps and waste not included, although taps shown are available as an additional purchase in the dropdown box. The matching WC suite is available as shown below. Price above excludes delivery - available for collection from our warehouses in Churt, Surrey GU10 2LN or Risca, Gwent NP11 6GQ or can be securely packaged and sent by carrier for an additional charge. For UK mainland addresses add £60.00, Scottish Highlands add £100.00, Northern Ireland add £110.00, Southern Ireland add £120.00. For delivery to other locations please ask for details.